Get a free SIM card for your mobile phone: Pay As You Go offerings compared from 20 UK networks. Whether you’re a smartphone fanatic or someone who only uses their phone on an occasional basis, there are some great deals to be had when you order a free Pay As You Go SIM card in the UK. The best Pay As You Go SIM cards offer super-low rates that can even rival Pay Monthly SIM cards in terms of value for money. To take advantage of the best offers currently available, simply order a free SIM card below and slot it inside your mobile phone. There are no credit checks required or upfront fees to pay. There’s also no need to set up a direct debit: simply top-up your SIM card when you need credit to pay for your airtime. In the table below, we’ve reviewed free SIM card offers from 20 of the UK’s most popular Pay As You Go networks. We’ve included mainstream providers as well as low-cost alternatives and specialist Pay As You Go mobile networks for calling another country. We’ve also compared the cost of each network to help you get the best value for money. Changing mobile network? If you’re keeping the same phone but changing to another network, it might be necessary to first unlock your handset. See our guides to unlocking an iPhone and unlocking a Samsung Galaxy handset. Coverage is identical on many mobile networks. Many networks share the same coverage provider: you’ll get identical levels of coverage when using any of these networks. To give an example, ASDA Mobile uses coverage from EE and giffgaff uses coverage from O2. Keeping your mobile number. If you’re changing mobile networks, it’s super easy to keep your current phone number. 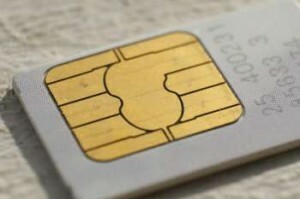 Once you’ve ordered your new SIM card, contact your current network and ask them for a PAC Code. You can then pass this PAC Code on to your new mobile network and your phone number will be moved over on the next working day. For more information, see our guide to transferring your mobile phone number. At present, ASDA Mobile is our top pick amongst the UK’s Pay As You Go offerings. They offer competitive 30-day bundles and 99% 4G coverage from the EE network. Rates: 8p/minute, 4p/text and 5p/MB internet (avg. 50p/day). ASDA Mobile offers a free Pay As You Go SIM card with 99% population coverage on EE’s 2G, 3G and 4G networks. For light users, ASDA Mobile charges 8p/minute and 4p/text. There are no regular monthly charges and your Pay As You Go credit won’t expire (you just need to use your phone at least once every 180 days to keep it active). The minimum top-up amount on ASDA Mobile is just £1 each time. For regular users, ASDA Mobile has a competitive range of 30-day bundles. Double data is available on these bundles until the 23rd May 2019, so you can currently get 600 minutes, unlimited texts and 6GB of internet for £10/month. To take advantage of the offer, you should order a free SIM card from the ASDA Mobile website. Amongst readers of our website, giffgaff and 1pMobile are also highly popular choices. They both offer low Pay As You Go rates with a number of different advantages. £10 top-up buys: Unlimited minutes, unlimited texts and 3GB internet. Rates: 15p/minute, 5p/text and 5p/MB for mobile internet (avg. 50p/day). giffgaff-to-giffgaff calls, texts and video calls are free. giffgaff is another highly-popular Pay As You Go offering amongst readers of our website. A fully-owned subsidiary of O2, giffgaff gives its members the exact same coverage as customers on O2. Most giffgaff members choose to buy a goodybag bundle. On giffgaff’s £10/month goodybag, you’ll get 3GB of internet along with unlimited minutes and unlimited texts. Goodybag allowances can be used in both the UK and Europe. For lighter users, giffgaff’s £7.50 goodybag can give you even bigger savings (you’ll get 250 minutes, unlimited texts and 2GB of internet for £7.50/month). Alternatively, if you’d like more data, you can get 8GB of data for £15/month, 20GB of data for £20/month or Always-On data for £25/month (unlimited downloads with the first 20GB per month at full 4G speeds). On giffgaff, you’ll get free calls and texts to other members (to qualify, you just need to top-up your phone at least once every 3 months). giffgaff also offers discounted rates for international calling. £10 top-up buys: Equivalent of 1000 minutes, 1000 texts or 1GB data. Rates: 1p/minute, 1p/text and 1p/MB internet (avg. 10p/day). 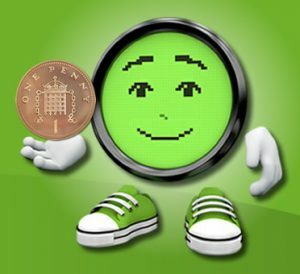 1pMobile is a relatively small Pay As You Go provider offering an eye-catching tariff of 1p/minute, 1p/text and 1p/MB. The network, which is operated by the sister company to Utility Warehouse, offers 3G & 4G coverage from EE. Smartphone owners can buy a Data Boost bundle from £4/month. A unique requirement of 1pMobile is you’ll need to top-up your phone at least once every 120 days. As the minimum top-up is £10 each time, this means you’ll need to top-up your phone with at least £30 of credit per year. For convenience, 1pMobile does offers automatic top-up functionality which you can use to make sure you meet the minimum top-up requirement. or 100 minutes, unlimited texts and 2GB internet (Data Pack). Rates: 30p/minute and 12p/text. Internet access requires a bundle. Coverage: 99% population coverage, 3G & 4G internet, check coverage here. EE offers 250 minutes, unlimited texts and 1GB of internet on their £10 Everything Pack. Alternatively, customers buying a £10 Data Pack will get 100 minutes, unlimited texts and 2GB of internet. Packs last for a duration of 30 days, but it’s possible to roll over unused data within 7 days of your pack expiring. For light users not buying a pack, calls will cost 30p/minute and texts will cost 12p each. Access to mobile internet is only available when you buy a Pay As You Go pack. 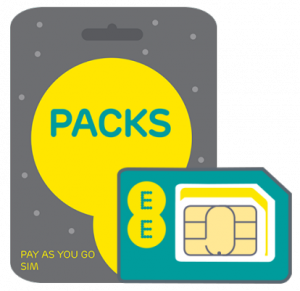 The cheapest available pack is the £5 Everything Pack which gives you 100 minutes, 250 texts and 150MB of internet. For more information, please see our full review of EE Pay As You Go. Tip: For £10/month, ASDA Mobile gives you 600 minutes, unlimited texts and 3GB of internet. Compared to EE’s £10 Everything Pack, this is more than double the number the minutes and three times as much data. The coverage on ASDA Mobile is provided by EE. Find out more about ASDA Mobile. £10 top-up buys: 500 minutes, 5000 texts and 2GB internet (Big Bundles). Rates: 3p/minute, 2p/text and 1p/MB for mobile internet (avg. 10p/day, Classic). O2 offers a choice of three tariffs on Pay As You Go. For smartphone owners, the most popular option is O2’s Big Bundles tariff. For £10/month, you’ll get 500 minutes, 5000 text messages and 2GB of internet. Unused data will rollover at the end of the month, but only if you renew your bundle automatically. For lighter mobile users, the Classic Pay As You Go tariff will be a more attractive option. With Classic, you’ll pay just 3p/minute, 2p/text and 1p/MB, with no need to top-up your phone every month. Alternatively, the International SIM card allows you to call other countries from 1p/minute. Customers joining O2 Pay As You Go will get access to discounts and offers through O2 Priority. For more information, read our full review of the Big Bundles and Classic Pay As You Go SIM cards. Tip: For £10/month, giffgaff offers unlimited minutes and an extra 1GB of data. giffgaff is owned by O2 and uses the O2 network for coverage. Find out more about giffgaff. £10 top-up buys: Unlimited minutes, unlimited texts and 2GB internet. Rates: 3p/minute, 2p/text and 1p/MB internet (avg. 10p/day). Coverage: 98% population coverage, 3G & 4G internet, check coverage here. Along with O2, Three is one of the UK’s cheapest mainstream mobile networks for traditional Pay As You Go usage. They charge 3p/minute, 2p/text and 1p/MB: the same as what O2 charges and just a little more expensive than 1pMobile. Regular users can save money by buying an All-in-One bundle. Bundles start from £10/month for unlimited minutes, unlimited texts and 2GB of internet. The allowances on your All-in-One bundle can also be used in 71 Feel At Home destinations including most of Europe, the USA, Australia and more. Importantly, it isn’t possible to use a 2G-only handset on Three. This is because Three doesn’t provide any 2G coverage. Your handset will need to support at least 3G coverage to work on the Three network. £10 top-up buys: 250 minutes, unlimited texts and 2GB internet (Big Value Bundle). Rates: £1/day for unlimited minutes, unlimited texts and 500MB data (Pay As You Go 1). Vodafone offers a choice of two different tariffs on Pay As You Go. For regular mobile users, it’s possible to buy a 30-day Big Value Bundle (e.g. 250 minutes, unlimited texts and 2GB of internet for £10/month). You can rollover unused allowances when you automatically renew your bundle. For occasional and light mobile users, Vodafone offers the Pay As You Go 1 tariff. On Pay As You Go 1, you’ll be charged 20p/minute, 20p/text and 20p per 5MB of data (capped at £1/day for unlimited minutes, unlimited texts and up to 500MB of data). If you’re under-30, it could be worth joining VOXI instead. VOXI is a sub-brand of Vodafone for people aged between 16 and 30. VOXI offers unlimited minutes, unlimited texts and 6GB of internet for £10/month. You’ll also get unlimited data for use on selected social media and instant messaging applications. 1pMobile is a virtual network operator using coverage from EE. The network charges just 1p/minute, 1p/text and 1p/MB: the lowest Pay As You Go rates currently available on any network in the UK. Customers joining 1pMobile need to be aware that a top-up of at least £10 is required every 120 days. If no top-ups are added to your account for more than 120 days, it will be closed automatically and your phone number will be lost. Because of this, we’d only recommend choosing 1pMobile if your typical monthly spend will exceed £2.50/month (otherwise, a non-refundable balance will build up over time on your account). 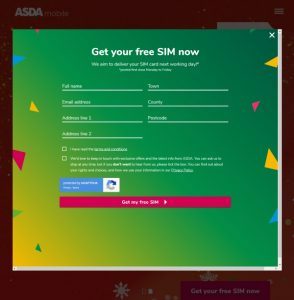 You can order a free SIM card from the ASDA Mobile website. For light users, ASDA Mobile has competitive Pay As You Go rates of 8p/minute, 4p/text and 5p/MB. There’s no need to top-up every month, and your credit won’t expire providing your account remains active (you just need to use your phone at least once every 180 days). You can top-up on ASDA Mobile from just £1 each time. Regular users can buy a bundle from ASDA Mobile for better value usage. It’s possible to get 6GB of internet along with 600 minutes and unlimited texts for £10/month. Alternatively, there’s 2GB for £7/month and 12GB for £15/month. To qualify, order a free SIM card from ASDA Mobile. ASDA Mobile provides 2G, 3G and 4G coverage from EE. This gives them 99% population coverage. £10 top-up buys: 650 minutes, unlimited texts and 1GB internet. Rates: 10p/minute, 10p/text and 10p/MB internet (avg. £1/day). Uses the O2 network. 99% coverage, 3G & 4G internet only, check coverage here. C4C Mobile is a fairly small Pay As You Go provider, with the unique selling point that they’ll donate 10% of your top-ups to charity. The mobile network offers 3G and 4G coverage from O2 and charges 10p/minute, 10p/text and 10p/MB. Bundles are also available to buy (e.g. 650 minutes, unlimited texts and 1GB of internet for £10/month). £10 top-up buys: 500 minutes, unlimited texts and 3GB internet. Rates: 8p/minute, 8p/text and 5p/MB internet (avg. 50p/day). Uses the EE network. 99% coverage, 3G & 4G internet only, check coverage here. CMLink is a Pay As You Go provider designed for customers who have a connection to China. The network offers free phone calls to China Mobile customers in Mainland China and charges a low 2p/minute rate for phone calls to other Chinese mobile networks and landlines. Customers on CMLink can also roam at no additional charge when travelling to Mainland China and Hong Kong. In the UK, customers on CMLink will get 3G and 4G coverage from EE. 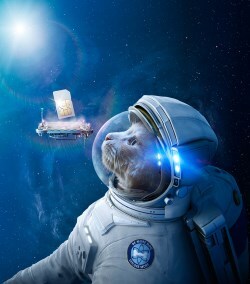 giffgaff is a low-cost mobile service running on the O2 network. They offer 3GB of internet along with unlimited minutes & texts for £10/month. Alternatively, heavy users can get 8GB of data for £15/month, 20GB of data for £20/month or Always-On data for £25/month. For more information, please see the giffgaff website. £10 top-up buys: 500 minutes, unlimited texts and 1GB internet. Rates: 3p/minute, 2p/text and 1p/MB for mobile internet (avg. 10p/day). Uses the Three network. 99% coverage, 3G & 4G internet, check coverage here. iD Mobile is the own-brand mobile network from the Carphone Warehouse. Having launched in December 2016, the iD Mobile Pay As You Go service uses coverage from Three. Customers on iD Mobile Pay As You Go will pay 3p/minute, 2p/text and 1p/MB. Alternatively, customers can convert their credit into a one-month bundle such as 500 minutes, unlimited texts and 1GB of data for £10/month. It isn’t possible to use a 2G-only handset on iD Mobile (as with Three, iD Mobile doesn’t have any 2G coverage). £10 top-up buys: 100 intl minutes, unlimited UK minutes, 1000 UK texts and 3GB internet. Rates: 19p/minute, 19p/text and 19p/MB internet (avg. £1.90/day). Uses the Vodafone network. 98% coverage, 3G & 4G internet, check coverage here. Lebara Mobile is a specialist provider of international calling. You can buy a 30-day bundle from £10/month with inclusive international calling (e.g. 100 international minutes, unlimited UK minutes and 3GB of UK internet). Alternatively, light users can use traditional Pay As You Go to call abroad from 1p/minute. Lebara Mobile offers 2G, 3G and 4G coverage from Vodafone. For more information, please read our full review of Lebara Mobile. 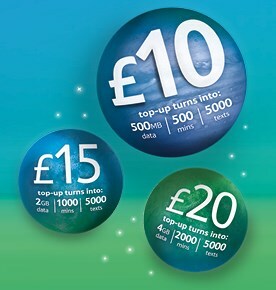 £10 top-up buys: 100 intl minutes, unlimited UK minutes, unlimited UK texts and 3GB internet. Rates: 19p/minute, 19p/text and 12p/MB internet (avg. £1.20/day). Lycamobile is another specialist provider of international calling. They offer international calls from 1p/minute and international text messages for 19p each. Domestic calls to a UK mobile are charged at 19p/minute and texts to a UK mobile are charged at 19p each. You can read our full review of Lycamobile here. 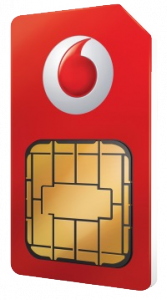 As of February 2015, it’s no longer possible to order a SIM card from Orange. Customers are instead advised to join EE Pay As You Go. EE has 4G connectivity and allows you to browse the internet from £1/week. Alternatively, ASDA Mobile gives you coverage from EE but at a much lower cost (8p/minute, 4p/text and 5p/MB). In July 2018, customers remaining on the Orange Pay As You Go service were migrated to EE. £10 top-up buys: 500 minutes, 1000 texts and 1GB internet. Rates: 8p/minute, 4p/text and 10p/MB internet (avg. £1/day). Uses the EE network. 99% coverage, 3G internet only, check coverage here. The Phone Co-op (previously known as the Co-Operative Mobile) charges 8p/minute, 4p/text and 10p/MB when you’re browsing the internet (this works out to be around £1/day if you’re using 10MB of data). For regular users, it’s possible to buy an all-inclusive bundle from £10/month. The most popular bundle from Co-op costs £10/month and gives you 500 minutes, 1000 texts and 1GB of 3G internet. In June 2018, The Phone Co-op became a part of The Midcounties Co-operative. Since the merger, you’ll earn 12 points for every £1 you spend on the network, which is equivalent to 5% back on your spend. £10 top-up buys: Equivalent of 200 minutes, 100 texts or 200MB internet. Rates: 5p/minute, 10p/text and 5p/MB internet (avg. 50p/day). Uses the Three network. 98% coverage, 3G & 4G internet, check coverage here. RWG Mobile advertises itself as “the mobile network for Wales”. It uses coverage from the Three mobile network, and offers bilingual customer support in both English and Welsh. £10 top-up buys: 500 minutes, 5000 texts and 3GB internet. Rates: 25p/minute, 10p/text and 10p/MB internet (avg. £1/day). Tesco Mobile offers a choice of two Pay As You Go tariffs: there’s Rocket Packs for frequent mobile users and Triple Your Credit for lighter users. For regular mobile users, it’s possible to buy a Rocket Pack bundle from £5/month. The most popular Rocket Pack costs £10/month and gives you 500 minutes, 5000 texts and 3GB of 4G internet. For lighter users not purchasing a Rocket Pack, Tesco Mobile has the Triple Credit tariff. Here, you’ll pay 25p/minute, 10p/text and 10p/MB. When you top-up your phone with £10, you’ll also get £20 of bonus free credit which will last for one month. For more information, please read our full review of Tesco Mobile Pay As You Go. As of February 2015, it’s no longer possible to order a T-Mobile SIM card. Customers wanting to join T-Mobile are instead advised to join EE. EE has 4G connectivity and offers Everything Pack bundles that are very similar to the Smart Packs previously offered by T-Mobile. Alternatively, ASDA Mobile offers 4G coverage from EE with better value monthly bundles from £5/month. Customers already on T-Mobile can stay on their existing plan for as long as they like. £10 top-up buys: Equivalent of 52 minutes or 52 texts. Rates: 19p/minute, 19p/text and 9p/MB internet (avg. 90p/day). Vectone Mobile is a specialist provider of international calling. See our international calls price comparison table to see how Vectone Mobile compares to rival networks. £10 top-up buys: 500 minutes, 500 texts and 2GB internet. Rates: 40p/minute, 15p/text and £2/day internet (up to 200MB). On Virgin Mobile, you can buy a Pay As You Go JAM Pack bundle from £10/month. The £10 JAM Pack will give you 500 minutes, 500 texts and 2GB of internet. This is restricted to 3G speeds, as 4G coverage is only available to Virgin Pay Monthly customers. If you choose not to buy a JAM Pack or run out of your inclusive allowances, you can use traditional Pay As You Go for 40p/minute, 15p/text and £2/day for up to 200MB of internet. This is amongst the most expensive Pay As You Go rates in the UK, so we’d strongly recommend choosing a lower-cost network if you’re a light user. £10 top-up buys: Unlimited minutes, unlimited texts and 6GB internet. Rates: 30p/minute and 14p/text. Internet access requires a bundle. VOXI is a youth-orientated Pay As You Go mobile service from Vodafone. Available exclusively to customers aged between 16 and 30, VOXI offers a choice of three 30-day plans. Their cheapest is a £10/month plan which until the 31st March comes with unlimited minutes, unlimited texts, 6GB of internet and unlimited social media usage. You can order a free SIM card from the VOXI website after which you’ll need to submit proof of age to activate your SIM card. This can either be done online or in a Vodafone retail store. For more information about any of the tariffs listed on this page, please click through to the mobile network’s website. Our recommended deal is currently to order a free SIM card from ASDA Mobile. If you’re asked to specify the size of SIM card required in your phone (e.g. 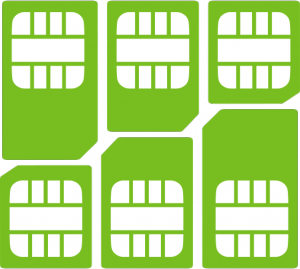 Standard SIM, Micro SIM or Nano SIM), please see our guide to smartphone SIM card sizes. The “£10 top-up buys” calculation is based on a user who tops up by £10 every month. If you top up less regularly than once every month, your allowances may run out before the next top-up. * Statistics on mobile network chosen by readers of this article. Based on the number of Free SIM click-throughs from the 1st September 2018 to 30th November 2018. ** Mobile internet charges. For networks that charge on a per-megabyte basis, we have given the average daily data cost for a smartphone user consuming 10MB of data. If you’d like to create a custom comparison using a different estimate, you can enter your own estimated data figure on our interactive Pay As You Go price comparison table. We'd love to hear your thoughts and any questions you may have. So far, we've received 317 comments from readers. You can add your own comment here. Have recently tried plusnet alongside EE same location and phone, plusnet poor in comparison ie indoors no service at all whilst EE is stil 4G capable. I’m told this is because plusnet does not have use of the 800mh band. So you know if Asda mobile is the same or does Asda have the 800 band and will work as EE? Thanks for your comment. I know that EE have certain restrictions on things like the maximum download speed their MVNOs are able to access. However, I’m afraid I don’t know all the details about 800MHz (band 20) coverage and which MVNOs are able to access it (e.g. I’m unsure if this relates to 4G Calling, which is only available on EE and BT Mobile at present). Sorry about that! I’ve been using O2 PAYG for over a year and have only topped up once (£10 when I started with them). I still have about £3 left. So it is untrue that you have to top up by at least £10 every 6 months. When I asked O2 why they hadn’t enforced the 6 monthly £10 top up they said it was because the SIM they gave me is not subject to the top ups and that O2 have changed the rules since I subscribed and now they do charge and that providing I keep using their SIM every so often they will not cut me off or charge me more. I’m not sure about that because from what I have read on their website over the years there has always been a minimum £10/six monthly top up rule with O2. Seems that you have to pay much more if you use a mobile phone rarely nobody is keen on you doing this the providers want us all to be phone zombies so they make it “seem ” cheaper to reel you in! No wonder the younger folk spend all their time on phones, wanting to get their money’s worth! I am just looking for a payg sim for smartphone that will accept £10 and keep going until it runs out even if you have to use it once a month! Is there one? Yes – there are lots of these “traditional Pay As You Go” providers about. You can see a full list and comparison of those providers here (or more information on the best SIM card for light users). I typically recommend ASDA Mobile for a number of reasons, including the low rates (8p/minute, 4p/text and 5p/MB), the generous inactivity policy (you only need to use your phone once every 270 days), the 4G coverage from EE and the ability to top-up your balance from £1.